The changes in winter precipitation and summer precipitation (with increased temperature and evapotranspiration) both cause increased risks of flooding during winter and increased risks of droughts during summer (see Fig. 1.4), which can further cause hazards to water quality, leaching of nutrients etc. Figure 1.4 Changes in water balance and impacts on freshwater cycle. Increased precipitation in winter will influence groundwater recharge, which again will lead to increased groundwater level and river runoff during winter, a dynamic, which eventually can lead to increased nutrient leaching to groundwater and surface water. Furthermore, the increased evapotranspiration during summer will increase irrigation demands for crops (See Fig. 1.5). 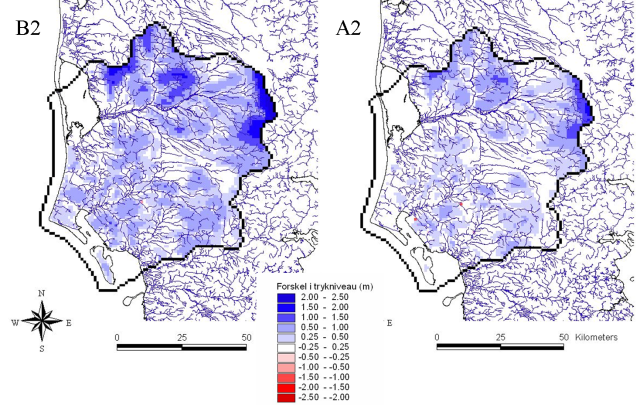 Figure 1.5 Simulated increase in irrigation amounts based on model simulations. White bars: Current situation, Black bars, scenario A2 Future situation). The change in freshwater and groundwater flow pattern may lead to higher groundwater levels (up to app. one meter, see Fig. 1.6) and higher annual flow of groundwater to rivers and coastal waters. This increase the risk of forced outwash of nutrients and pesticides from agricultural areas and pollut­ants from industrial areas and old landfills, leading to increased threats to groundwater bodies and dependent aquatic ecosystems (lakes, rivers and coastal zones) that formerly were considered as well protected. Addition­ally sea level rise will increase the increased risks of salt water intrusion in coastal aquifers and the risk of flooding, significantly. In Fig. 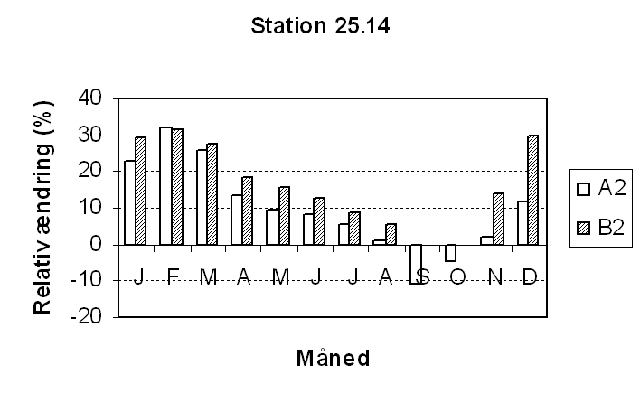 1.7 is shown the changes in baseflow in Skjern river (station 25.14 Skjern å, Alergaard). Figure 1.7 Example of simulation of changes in river flow. During summer most of the runoff comes from groundwater discharge (baseflow). The figure shows that for climate scenario A2, the river runoff will be decreased in September and October (5-10 % compared to current situation). For the rest of the year, there will be an increase in monthly river runoff, for some months with 20-30 %, compared to current runoff. Hence, the climate change could work against measures taken to assure good chemical status for European water bodies by 2015. Groundwater is our shared resource that we need to manage this important resource properly to protect both human health and social systems (drinking water, flooding risks etc.) and dependent ecosystems. 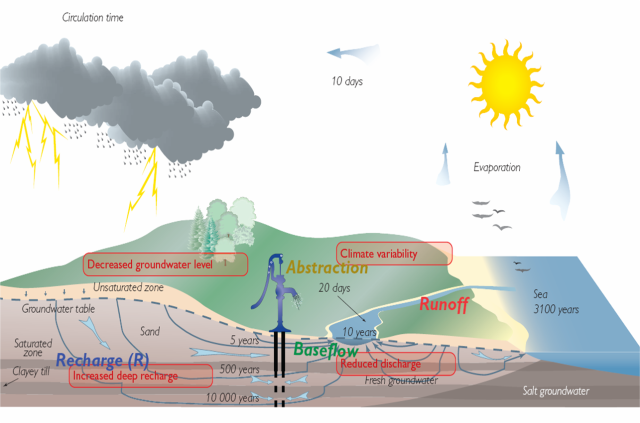 When groundwater quantity and quality change due to climate change the associated ecosystems most likely, will also change.